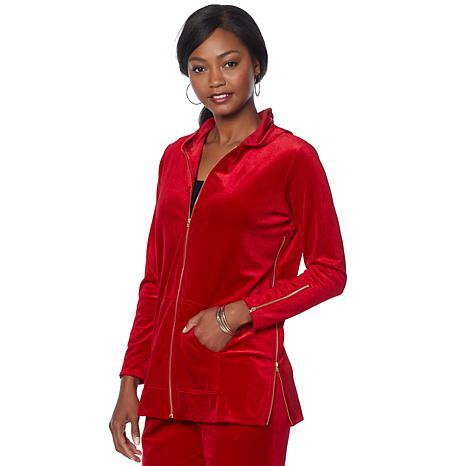 Live your most glamorous life with this stretch velvet hoodie from Antthony. Stylized zippers and a subtle sheen add casual-glam style to your everyday look. So pretty - love these colors! Runs very big. I ordered an XL and althought I do like them roomy, I could of probably could fit a M. I wish I had one in every color. 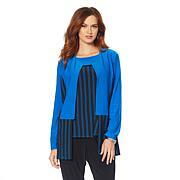 I previously ordered this velvet tunic in purple in a medium and the pants to match.. I fell in love the feel of the merterial, as well as, the fit/lenght. I love it so well I ordered the outfit in black. You won't be disappointed. This is a perfect matched set with the pants. I ordered red and black. It is so comfy. i love it i appreciate atthony"s choice of fabric and special addons like the zippers. easy wash and wear goes along way. This is so beautiful and extremely soft. The color is a rich blue love the color. I ordered down a size M petite.. I am 53 and the length is great with leggings also.This is my 1st Anthony and I am going back for another.. maybe purple or black..Also thank you HSN customer service you have been the best during this Holiday..
Design details elevate this soft, brushed-knit hoodie, including extra-wide cuffs and mesh inserts on the sleeves. Perfect for kicking around in comfort.